At the end of the nineteenth century, tens of thousands of Poles, Lithuanians, and Belarussians were exiled to penal labor camps in Siberia and the Far East of Russia for having participated in nationalistic revolts. Around the same time, the Russian army issued a command drafting young Poles, who until that time had been exempt from military service. Great numbers of Poles began serving in the navy and in regular battalions in the eastern provinces of Russia, and this meant that Polish-speaking priests were needed in Siberia and the Far East to minister to the spiritual needs of the Catholics. The first Catholic priest arrived in the Far East in 1867 and began serving Catholics of the huge territory including Sakhalin Island, the Kamchatka Peninsula, and the coastal settlements, as well as Nikolaev-on-the-Amur, Khabarovsk, and Blagoveschensk. The priest was based in the region, making regular trips by boat in the summer, and by either horse or dogsled in the winter to visit his distant congregations and bring them the sacraments. After the governor general’s residence was moved from Nikolaev to Vladivostok, a large part of the armed forces and administrative personnel moved there as well. The Catholic priest also found it necessary to move to Vladivostok, not only because of the general shift in population, but because it was much easier to serve his congregation with Vladivostok as his base. In 1912 a new Catholic priest was appointed for Vladivostok, an experienced and highly educated man by the name of Karol Sliwowsky. Coming from the Warsaw nobility, he had completed high school, seminary, and studies at an ecclesiastical academy, where he earned a Master of Divinity degree. In the first years after his studies, Father Sliwowsky served in two parishes in the Eparchy of Mogilev, the Catholic diocese for all of Russia, until he was transferred to Kazan. We know about his character and his attitude toward his duties from archival materials. Of special interest is a letter submitted to the metropolitan archbishop of Mogilev by Father Sliwowsky’s parishioners and church employees, who considered it their moral obligation to petition the diocesan authorities to confer on him the title of Honorary Canon. The arrival of such a businesslike, vigorous and multi-talented pastor changed the life of the Vladivostok parish in many respects. The priest took upon himself all of the many parish responsibilities, as was his practice. We know about this from the written complaints of church employees whom Father Sliwowsky let go in favor of other, more diligent workers. According to the reports of those parishioners who lived to tell us about their priest, magnificent religious celebrations were carried out in the church and a skilled organist played at all the services, which were beautiful and solemn. 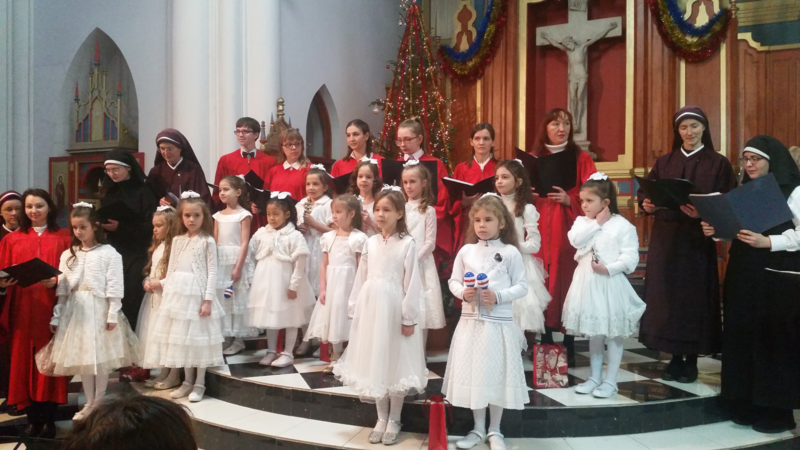 Warm attention always surrounded the children, who even in recent years, despite their respectable age, remember both Father Sliwowsky and the beautiful celebrations in the church, particularly, Christmas, Corpus Christi and their unforgettable First Holy Communion. In 1920 the Archbishop of Mogilev established the Vladivostok deanery, which included the parishes of Vladivostok, Khabarovsk, Blagoveschensk, Nikolaev, Ussurisky-Nikolsk, Alexandrov on Sakhalin Island, and Harbin (in China). A total of 11,000 Catholics were registered in the Vladivostok Deanery, and five priests ministered to all of them excluding those in Harbin. Karol Sliwowsky, Master of Divinity, Honorary Canon, Prelate, and Third Degree member of the Order of Stanislav, was appointed Dean. 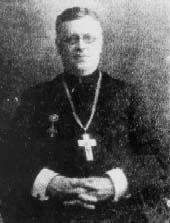 Within three years, on October 28, 1923, Father Sliwowsky was consecrated Bishop of Vladivostok. The rite was performed in Harbin, China, by Bishop Constantine of Peking (Beijing), assisted by Bishop Gaspee from Giryn, China. Bishop Sliwowsky served in Vladivostok until the closing of his cathedral by Soviet authorities. He spent the last years of his life in the Vladivostok suburb of Sedanka, where, seriously ill, he was cared for by Casimira Piotrovskaya. 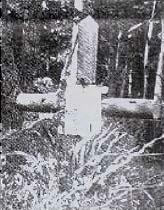 Simple cross that originally marked Bishop Sliwowsky’s grave. 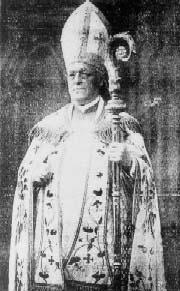 Bishop Sliwowsky died on January 5, 1933, at the age of 85. Casimira ordered a galvanized metal coffin in which to send his body back to Poland, but authorities would not allow the body to leave Russia. A very modest funeral was held in an old cemetery in Sedanka. No tombstone was placed on the grave, only a simple iron cross on which were written in Polish the name, date of birth, and date of death of this first bishop of Vladivostok. After the death of the bishop, Casimira held onto his few personal effects until her departure to Poland, when she transferred everything to a former member of the Vladivostok Parish, Mr. Stanislav Stanko, for safekeeping. Stanislav’s daughter, Regina, also a former parishioner and now living in Tomsk, has written us some letters about her early years. She informs us in particular that in August 1938, her father was arrested and her family was sent to Siberia. During the arrest the contents of the wooden box containing the Bishop’s effects were confiscated. Thanks to the assistance of members of the organization “Memorial,” it was possible to find the KGB files on Stanislav Stanko, containing an inventory of the Bishop’s personal effects: a typewriter with Latin typeface, a book in the Polish language which may have been a Bible, a gun, a set of binoculars, photo albums, a tea set, and a few other items. Most likely these will never be seen again. The members of Most Holy Mother of God parish have been searching for the grave of Bishop Sliwowsky. Although they have a modest photograph of the site from Regina Stanko, in the past 60 years there has been much growth in the woods, hiding all visible signs. The hope remains that people who lived in those days will remember something and be able to prompt a more precise search for the grave. May God help us in our good intentions! Additional information about the bishop can be found in the January 1, 2000 issue of the Vladivostok Sunrise newsletter.